To be honest, there are no secrets to drawing realistic glass. Drawing glass is just like drawing anything else, it's simply all about observation. The better you are at recognizing shapes of color and value and then putting that information on your paper, the better you will be at drawing anything, including glass. What makes transparent or reflective objects great subjects are the challenge that they present to the artist. You have to trust what your eyes are seeing, instead of drawing what you think it should look like. When you look closely at reflective surfaces, you will notice areas of high contrast that form abstract shapes. It is the accurate depictions of these shapes and contrast of value that will lead to the illusion of glass in your drawing. The only way to get this right is to closely observe the subject, trust what you see, and put that information on your drawing surface. In essence, this is the process of representational drawing anyway. When you observe glass or any reflective surface, you will notice areas of dark value nestled right next to light value. This extreme contrast in value is what makes reflective surfaces look reflective. Get this contrast right, and you'll get the illusion of glass right. The drawing surface will affect the illusion that you create. 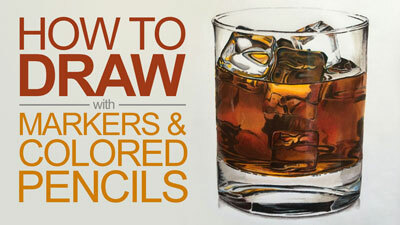 Smoother drawing surfaces will lead to the illusion of smoother surfaces in your drawing. Since glass is a smooth surface, it makes since to choose a smooth drawing surface to create the illusion. Rag paper, some drawing papers, and Bristol paper will all provide suitable supports. People approach using drawing media in different ways. We are all unique artists. We all have unique ways to approach our media. When it comes to colored pencils there are five things to keep in mind in order to ensure success. Apply Heavily - The first is to color heavily, or build up your colors to a heavy application. 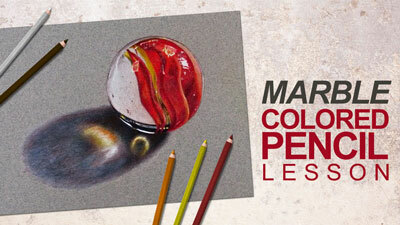 Applying the colored pencils in this manner will make the drawing look almost like a painting. Layer Colors - The second tip is related to the first. When using colored pencils, you should layer the colors. Layering colors over each other will provide depth in the color. Layering will also naturally mix the colors and will lead to a heavy application of the pencils on the surface. Mix Colors - The third tip in using colored pencils is to mix your colors. Seldom will the color that the manufacturer made match your needs. Mixing your colors will lead to more natural colors that will make your drawing look more realistic. Take Your Time - It is also important to consider that colored pencil drawing is a time-consuming endeavor. Take your time when applying colored pencils. Work slowly and deliberately. Add Details Last- Lastly, you should add details last. 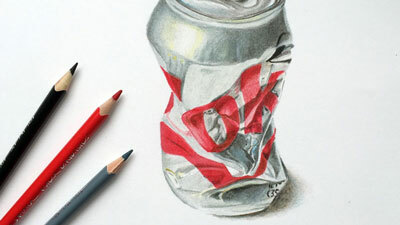 Since colored pencils are so easy to layer, it makes sense to layer your details as well. You can add them directly on top of previously applied areas of colored pencils.